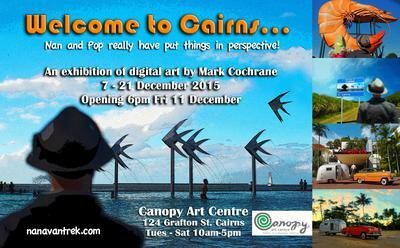 Welcome to Cairns is a quirky "retro" perspective digital art exhibition, about Cairns and its surrounds, by following the adventures of "Nan and Pop"! 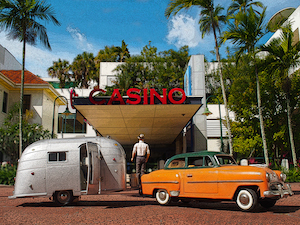 Miniature Nan & Pop dolls, along with their retro car and airstream caravan, have been beautifully photographed in extraordinary and iconic locations all around FNQ. Using old school camera techniques and playing with forced perspective, Nan and Pop really have a fresh and funky take on "pop" art. Following from a popular TANKS exhibition, this is the first solo exhibition of digital artist Mark Cochrane. These colourful works have spawned from "Nan & Pop's" blog site nanavantrek.com which has an ever growing international following – it’s a fun project literally with a life of it's own! The Pop character has even got into selling real-estate! The bright and engaging exhibition includes mixed media pieces and even travel spoons! There's also a collection of other works by Mark including a robot out and about menacing Cairns. Asked about how he came to develop the Nan and Pop characters and their travels, Mark had this to say - "I have been working in the film and TV business, making TV content, music videos and commercials since the 1980's, here and overseas (I worked for 6 years in Rome). I won several awards for my TV work, until I paired up with Nan & Pop that is. For the past 12 years I worked for an Indigenous TV station in Broome. I went to Broome on a 6 month contract to mentor Indigenous kids in TV and ended up there for 12 years. I started taking "my toys" along with me on film shoots, just for fun, to some of the amazing Kimberley locations, some very remote, that I filmed in. A series or sequence of Nan & Pop on their Kimberley travels ended up selling in an exhibition for Environs Kimberley and in the Broome Shinju Matsuri Festival. I moved from Broome to Cairns in June 2015, in a car loaded (stuffed actually) with all my belongings for a new adventure and new life in Cairns. Travelling in the front seat with me in my over packed car was my vintage toy caravan and car and a Pop barbie doll. It was here I started a blog the day I left Broome. nanavantrek.com. This was to document the trip, using the memories of my own loveable Nan & Pop. So, along on the adventure, where ever something strange, or beautiful passed by my wide open eyes, I stopped and took a picture. They weren't just 'happy snaps', despite the fun, they were well crafted photos using lots of old school techniques like open frame photography, multi-focal as well creating forced perspective. On the long trip from Broome to Cairns my companions were in fact Nan and Pop as I would stop and take their "selfies" at fabulous locations, some iconic or just something odd. My Nan and Pop were famous for their mixing up of sayings and spoonerisms. They were a lovely couple, fondly remembered especially for Pop who referred to "Paw Paw New Guinea", or mix-ups like "It's like a fly in the ice-burb". Photos were often several taken from one location with different planes of focus to create the perspective, which you can't actually get by taking one picture. From Katherine onwards to Cairns, Nan and Pop went to "find the Silver Sands", a property that I had purchased many years before. As the story goes they'd inherited keys from Aunty Beryl and weren't quite sure what Silver Sands was. So that was their mission - me along with the Nan and Pop barbies and their trusty old caravan and old car trooped towards Cairns. Meanwhile, almost in a world of its own the blog and social media following happened exponentially. And as the 8 day drive from coast to coast happened so did the following grow, world-wide. Nan and Pop arrived in Cairns and their adventures, discovering Cairns (as well as my own) developed into the current exhibition "Welcome to Cairns". 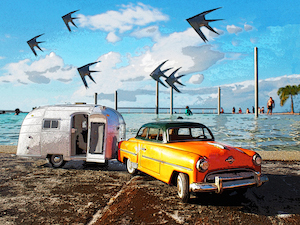 The digital art on display, spawned from these travel "snaps" which are reworked, manipulated and touched up/painted extensively in post production. But essentially the objects are photographed on location without pasting them in photoshop. I'm often lying on the road with Pop lined up in perspective with the caravan and car, and people come up to me asking if I'm alright spread eagle on the road. From one coast to another I've met people fascinated and amused with what I'm doing and they love to see what I'm doing and how. It really is just a lot of good fun. Their perspective is created at the time of the photograph." Check out this fun take on “Pop" art at the Canopy Art Centre from 9 - 21 December. Opening night Friday 11th December.